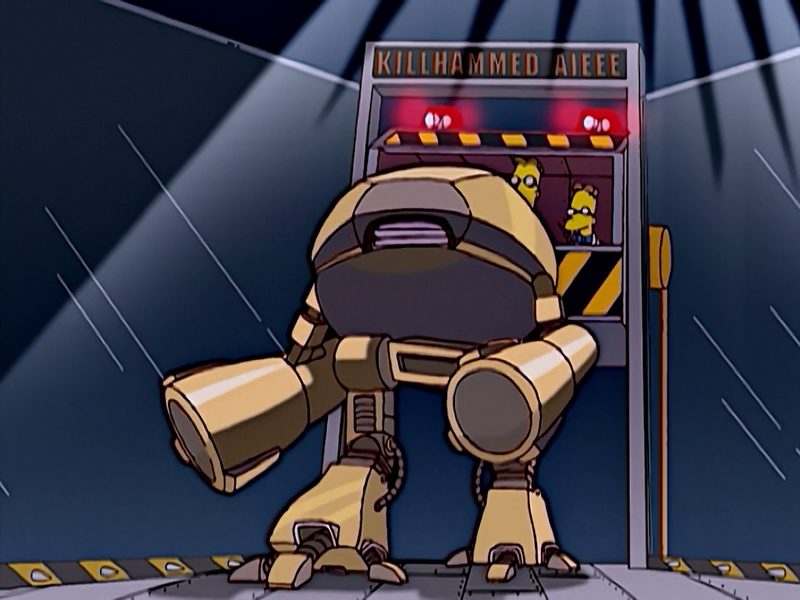 Killhammad Aieee was a robot built by Professor Frink and his son, John Frink III, to fight in the TV show Robot Rumble. The Frinks were very successful on the show, winning five consecutive championships. Killhammad Aieee stood several feet tall, walked on two legs, and had huge machine guns for arms. It was completely non-humanlike in appearance: Its body and head were combined into one main piece shaped approximately like a truncated cube cut in half horizontally, to which the arms and legs were attached. The robot could also morph some parts of its body to serve non-aggressive purposes, such as making a chaise lounge. Killhammad Aieee had a weak area in its posterior, but Frink reinforced it, thus making the robot all but invulnerable. In the championship match on Robot Rumble, Killhammad Aieee fought Chief Knock-A-Homer. Killhammad Aiee knocked Chief Knock-A-Homer around the rink several times, toppling it over. Then another blow smashed Chief Knock-A-Homer open, revealing that Homer Simpson was inside. Seeing this, Killhammad Aieee stopped attacking, because it had been programmed with the Three Laws of Robotics and was thus incapable of harming a human being. Instead of finishing Homer off, Killhammad Aieee morphed part of itself into a chaise lounge, seated Homer in the lounge, and served him a martini. Because the fight was technically never finished, the Robot Rumble announcers declared the championship match to be a draw, which infuriated the studio audience. Killhammad Aieee's name is a pun on famous boxer Muhammad Ali. Killhammad Aieee bears a very strong resemblance to the ED-209 droid from RoboCop. The Three Laws of Robotics are detailed in the sci-fi short story collection I, Robot by Isaac Asimov. Modified on April 4, 2019, at 00:45.